Ted Cruz, Hillary Clinton -- and Goldman Sachs? 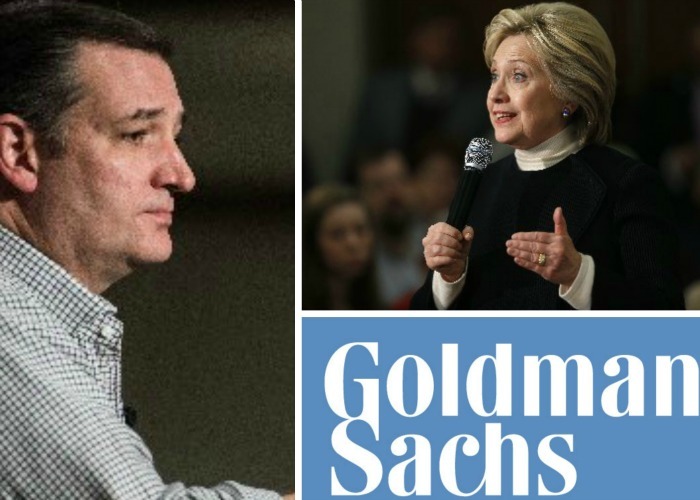 By W. Gardner Selby on Tuesday, January 19th, 2016 at 5:02 p.m.
Ted Cruz and Hillary Clinton have Goldman Sachs in common -- or so critics say (Associated Press photos). Back from the MLK Day holiday, a big number stuck in our heads. So, here’s the number we couldn’t shake: $600,000 -- in speaking fees? In Sunday’s Democratic presidential debate, which aired on NBC and livestreamed on YouTube, Sanders brought up Goldman Sachs, saying: "Let me give you an example of how corrupt — how corrupt this system is. Goldman Sachs recently fined $5 billion. Goldman Sachs has given this country two secretaries of treasury, one on the Republicans, one under Democrats." A beat later, Sanders said: "The leader of Goldman Sachs is a billionaire who comes to Congress and tells us we should cut Social Security, Medicare, and Medicaid." Hold that pony: The Times said in a post-debate fact check that the Vermont senator based his declaration on what Lloyd Blankfein, Goldman Sachs’ ceo, said in a 2012 interview by CBS News. At the time, Blankfein said entitlements like Social Security needed to be "slowed down and contained," since "we can’t afford them." But Blankfein also said: "In the long run there has to be more revenue, and of course the burden of that revenue will be disproportionately taken up by wealthier people. That’s just logical." Blankfein said that necessitated "more taxes on wealthier people," which later proved to be a Sanders’ campaign plank. In Sunday’s debate, Sanders went on: "Secretary Clinton — and you’re not the only one, so I don’t mean to just point the finger at you, you’ve received over $600,000 in speaking fees from Goldman Sachs in one year. I find it very strange that a major financial institution that pays $5 billion in fines for breaking the law, not one of their executives is prosecuted, while kids who smoke marijuana get a jail sentence." But did Clinton pull down all that much solely for Goldman Sachs speeches? If she spoke to company meets, say, 10 times in the year, that’s $60,000 a talk. Clinton was paid far more -- $225,000 a speech for 2013 appearances before the Goldman Sachs Group in Palmetto Bluffs, S.C., June 4; New York, Oct. 24; and Tucson, Oct. 29, according to a document her campaign released in July 2015. Those speeches were among 41 that Clinton delivered in the year, ultimately fielding $9.7 mil­lion in speaking fees, the National Journal reported at the time. Clinton’s "stand­ard rate ap­peared to be $225,000 for most speeches; her most ex­pens­ive ones were an ap­pear­ance for the Jew­ish United Fund/Jew­ish Fed­er­a­tion of Met­ro­pol­it­an Chica­go, for which she made $400,000, and one to Beau­mont Health Sys­tem in Troy, Mich., for $305,000," its story said. In Sunday’s debate, Sanders said a primary difference he has with Clinton is that he doesn’t "take money from big banks. I don’t get personal speaking fees from Goldman Sachs." He later said: "Can you really reform Wall Street when they are spending millions and millions of dollars on campaign contributions and when they are providing speaker fees to individuals? So it’s easy to say, well, I’m going to do this and do that, but I have doubts when people receive huge amounts of money from Wall Street." We asked Sanders' campaign about his speaking fees over the years and didn't draw a breakdown. By email, spokesman Mike Casca pointed out the senator's Senate finance filings as compiled by the Center for Responsive Politics. In Sunday's debate, Clinton didn’t speak to the fees nor did we hear back from her campaign when we emailed about Sanders’ criticisms. Clinton’s July 2015 press release was silent on her speaking fees though she then said generally: "We’ve come a long way from my days going door to door for the Children’s Defense Fund and earning $16,450 as a young law professor in Arkansas—and we owe it to the opportunities America provides. I want more Americans to have the chance to work hard and get ahead, just like we did." Meantime, we asked Goldman Sachs about what it paid Clinton and the 2012 loans that helped Cruz run for the Senate. By email, spokesman Andrew Williams did not mention Cruz or Clinton, writing: "We host hundreds of conferences around the world for our clients as do so many other companies competing for business. We all want speakers that will interest our clients. For example, we have hosted speakers at client events ranging from Derek Jeter to Misty Copeland to Elon Musk." Now, what are you hearing that merits a fact check?